Originally uploaded by FeedBurner Fotos. I saw this photo today on my Flickr start page. 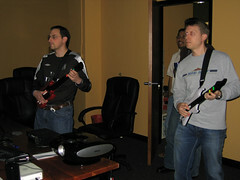 It’s two of the founders of FeedBurner (Steve and Eric) playing Guitar Hero II against each other. I always knew FeedBurner rocks. Bur now we have proof. But I want to know who won.